Yes, the initial costs can be high, but then you get to reuse a lot of materials the second year and later on. I think the first year may often be a loss or wash for most people, but from then on you’re usually going to do pretty well. It just depends on how frugal you try to be while doing it! But it shouldn’t just be a financial decision because it does require a time commitment and there are intangible benefits that you can’t put a $ to. Yeah, I figure if I was really serious about bookkeeping I could amortize the cost of the planters over 10 years or something (maybe 5, just to be conservative about it) but that’s really not my goal. I poke around the interwebs from time to time, thank you for your compliments. Funny, I have never considered myself a green thumb, but I like your thoughts here. Do you have any recommendations for winter ( inside ) gardening? I have seen some things with tomatoes, but I truly know nothing about this subject. I don’t actually have any experience with winter (inside) gardening. If you have access to enough light (a southern window), maybe you could try some container gardening techniques. If your house stays warm enough for the type of plant you’re growing, you should be able to grow it. The plants don’t really care what the season is – the conditions just need to be right to grow it. 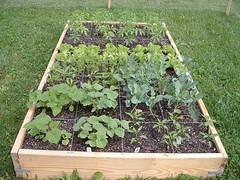 Maybe lettuces, spinach, radishes, carrots, or onions could be a small start. You could try tomatoes or peppers if you have big enough pots and a good spot. Let me know if you try any of those suggestions! Is that a picture of your garden in the second photo? Marvin is convinced we can’t grow a garden in Florida because of the sandy soil. But from that picture, you could actually use potting soil or one of the soils that have a slow release fertilizer. I’ll have to show it to him and maybe we can put out something small behind the swimming pool. 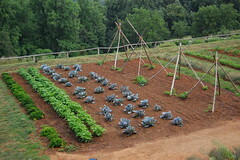 I think we could get 2 growing seasons per year.